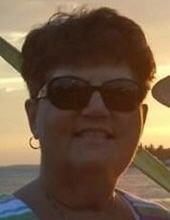 Debby S. Mapp, 63, passed away peacefully on April 3, 2019, surrounded by her loving family. Debby was preceded in death by her mother, L. Pauline Davis, and her father Robert Calvert, her sister, Lucille Branson, her brother, Robert “Bobby” Calvert, her granddaughter Serena Elizabeth Ansbro; and her beloved husband of 23 years, Thomas M. “Tommy” Mapp. Debby is survived by her daughter Jamie Massey (Ramey), her grandson Dylan Ansbro (Torrie), her granddaughter, Brenna Ansbro; and also several nieces, nephews and cousins from Missouri and Kansas. Debby treasured time with her family, especially her grandchildren, her pride and joy. She always kept track of all that was going on in the lives of family and friends. She loved retirement living in central Florida with her husband, Tommy, where they enjoyed traveling together. Debby knew that the world was big and wanted to see as much as she could. She especially loved her “beach time”. Planting gardens, baking during the holidays, and trivial pursuit her around the house passions. A celebration of life will be held at Bennett and Barden Funeral Home, 3215 Anderson Hwy, Powhatan, Va. 23139 on Saturday, April 13 at 11 a.m.
To send flowers or a remembrance gift to the family of Debra Suzanne Mapp, please visit our Tribute Store. "Email Address" would like to share the life celebration of Debra Suzanne Mapp. Click on the "link" to go to share a favorite memory or leave a condolence message for the family.